WTB Silverado and SL8 Saddles: Quick Review- by Guitar Ted A while back we told you about the new, wider versions of the SL8 and Silverado saddles. 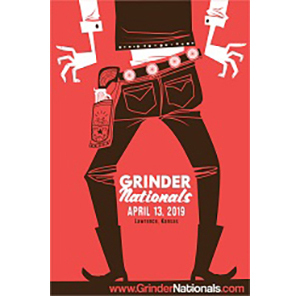 You can go back and catch up on that if you click this link. There you will learn all about the dimensions, weights, and other features these two saddles have. Now that both have been ridden in the field for a while I have my impressions on both of them to share with you here. I will take each saddle individually and give my impressions on each, then I will give a nod to which is my favorite, and why that is. Disclaimer: Saddles are very personal as they represent probably the most important contact point of all. Fit is unique to each of us and these saddles may not even be close to what you need. That said, good saddle fitting is available at many good LBS retailers and online. Get informed, fitted, and saddle selection becomes a tad bit easier. Now on with the review! The WTB SL8 is a saddle designed for Cyclo Cross events. It could work as your gravel travel saddle too. 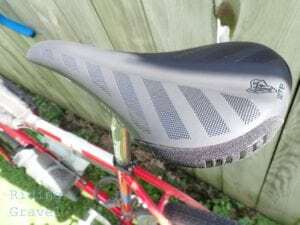 WTB SL8 Saddle: This is the model designed for the cyclo cross racer in mind and therefore it is a bit shorter, broader across the back, and flatter than the Silverado. I was a bit skeptical about this as I typically gravitate toward longer saddles and profiles which feature the typical WTB “bucket”, or dip in the mid-saddle area. 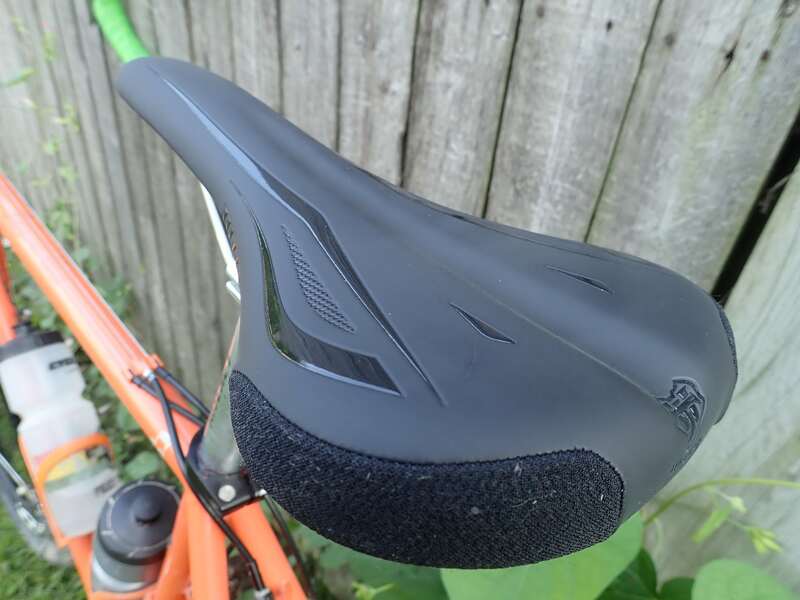 The SL8 is probably one of the flattest saddles I’ve ridden in some time. Also worth noting is that this saddle has a different relief pattern in the saddle hull which would seem to make the saddle a bit stiffer through the middle than WTB’s other saddles. That makes sense if you think about how a cyclo cross racer pretty much launches their full body weight right on the saddle when remounting after a barrier run up. A flexy saddle wouldn’t be a pleasant landing pad. But what about ride comfort? Obviously I wasn’t going to be doing any barrier hopping or run ups with the bike on my shoulder out on the gravel. 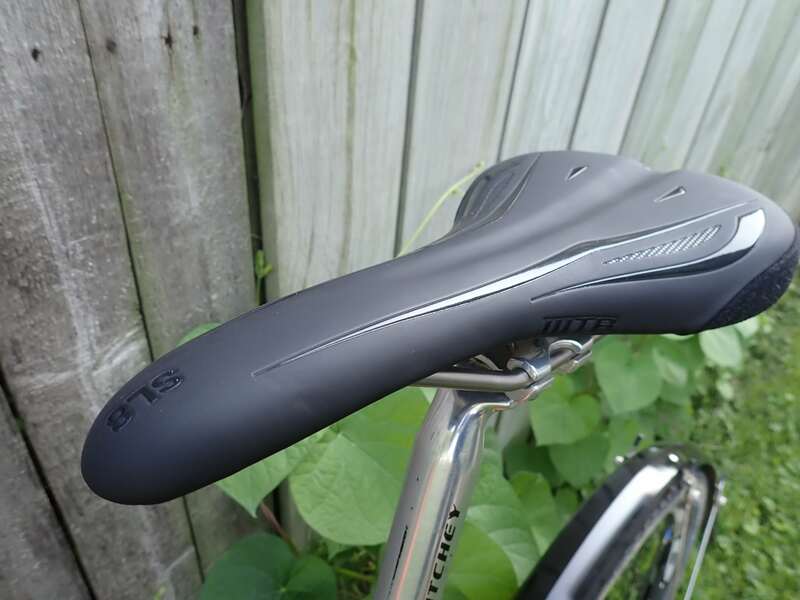 The SL8 isn’t completely flat, but it is one of WTB’s flatter saddles. Well, while I could feel that stiffness I didn’t feel that the SL8 was “bruising” my undercarriage or causing discomfort. The flatter profile is……ah…okay? Well, again, I don’t gravitate towards such saddles, but it wasn’t offensive or uncomfortable. The shorter length I noticed, but it wasn’t bothersome. I could live with that. The Microfiber cover isn’t too tacky, but it avoids being too slippery. Pretty much what you want in a cover. It doesn’t absorb moisture either, which is nice. If I had one complaint it would be that, for my tastes, the SL8 lacks anything to “push back against” while doing any seated climbing. That’s a very minor nit. Maybe I might add the shorter width, although that didn’t bother me as much. I did note that this saddle seemed to have one “sweet spot”, and other positions weren’t as comfortable, which I attributed to the shorter length here. That would be my single most reason for maybe shying away from this saddle. That will be borne out in what I have to say about the Silverado……. WTB Silverado Saddle: This was the saddle which I was most familiar with since our contributor, MG, is a big fan of the original version. That version was too narrow for my behind, so I never was motivated to find out what all his raving was about. Now, however, I could try it since this saddle is 142mm wide and in the range of widths I could consider as fitting my needs. Plus, the Silverado features a more traditionally “WTB-esque” profile- The droopy nose, the “bucket” in the mid-section, and the tail in back to push off on. The Silverado has a more rounded tail section than the SLB. Note the “bumper” guards, found on both saddles to ward off scrapes and tears. My only trepidation with the Silverado was that it has a very rounded off back end which I was thinking might prove to be a bother. However; I never noticed it while riding the saddle, so that was an unfounded fear. Essentially, the Silverado is a very reminiscent experience to a Pure or Pure V, if you are familiar with those WTB saddle offerings. I would say that the Silverado exhibits the same feelings with a slimmer, lighter, and less plush package. The Silverado has that mid-section which is comfortable to slide up into when you are climbing steep pitches yet allows you to slip back and push hard at tempo against the raised rear section. The slightly droopy nose, a WTB hallmark, allows for a temporary seated position on really steep climbs and then gets out of your way when you stand or sit down again without snagging your clothing. The same Micofiber cover as the SL8 only with a different graphic is here, so again- no downsides and lots of benefits to that feature. My only negative was the aesthetic appeal of the graphic on the Silverado. I could do without those stripes, but hey! If I am riding the bike, I cannot see those, so….. In the end I understood all the reasons MG was in love with the Silverado. It allows for a great freedom of movement in the drops, yet it is comfy, and I like the multiple comfortable seated positions the Silverado brings to the table. The width was just right too. The Flex-Tuned Shell on this model is more open underneath than the SL8’s and it makes the Silverado feel smoother than the SL8 does. I appreciated that also. At The Finish: Well, it doesn’t take much to figure out that, for me, the Silverado was the clear winner here. 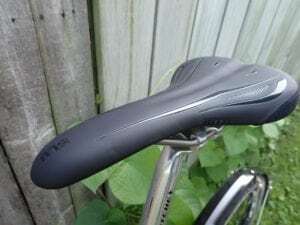 Not that the SL8 isn’t a great saddle. It just lacks a few things the Silverado has which I find to be very useful and comfortable. I think that for those looking for a shorter saddle, or a flatter profile than typical in a WTB saddle, the SL8 is an excellent choice. I can see the bennies for cyclo cross racing too. I just do not engage in such activities. So, for my needs, the Silverado is a better fit, (apologies for the pun) and I am happy that WTB decided to introduce it in this wider size. My favorite of the two, the Silverado, features a more “WTB-esque” profile than the SL8 does. The Silverado and the SL8 are offered in a few different versions, mostly differing in rail material, to fit different price points and needs. Also worth noting- The SL8 also is offered in a very wide 150mm width which may be appropriate for those who are needing a wider, shorter saddle than is typical, but don’t want to sacrifice light weight and comfort. Of course, as I stated above in the disclaimer, these may not be for you, but if they are in your wheelhouse size and shape-wise, give these WTB saddles a look. 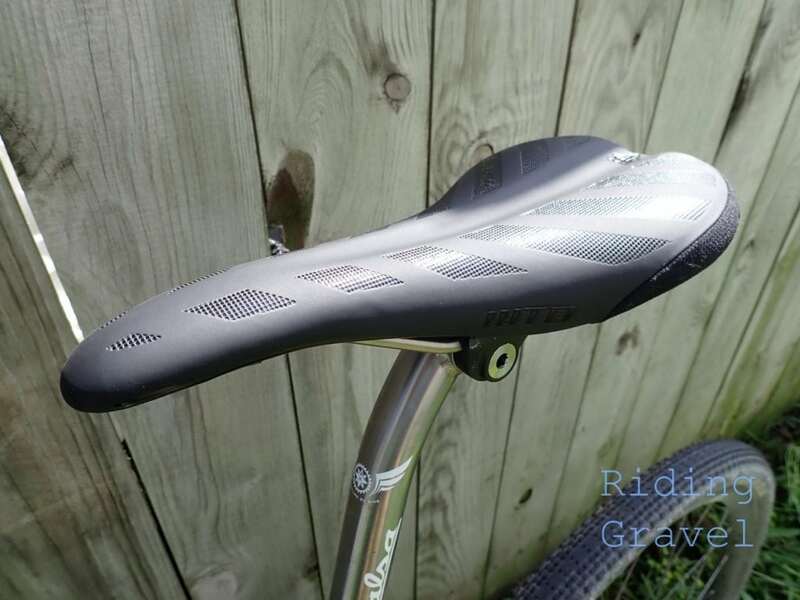 Note- RidingGravel.com was sent these saddles at no charge for test and review by WTB. We were not paid, nor bribed, for this post and we strive to give our honest thoughts and opinions throughout. Thanks for the review. Are you familiar with the WTB Volt and can you say if the nose on the Silverado is equally as skinny? @Ryan- I’ve seen the Volt, but not ridden it. I’m not being impressed that the Silverado’s nose is skinny, so take that for what it is worth. Having ridden both the Volt and the SIlverado extensively (including riding a Volt at the DKXL this year), I find the Silverado actually works better for my anatomy. The nose is narrow, but it’s a much more comfortable shape for my posterior, overall.